Lead Character Artist for The Last Guardian. From 2015, he participated in the production as a member of the genDESIGN staff. ―I have a few questions I'd like to ask about modeling, so let's welcome modeling artist Sakai-san who joins us to talk about this topic. Jumping right in, Sakai-san, what was your position when you first got involved in The Last Guardian? SakaiI really only got involved in the final stages, but I was put in charge of the modeling of important parts like Trico and the boy. It was really difficult, but at the same time it was also very rewarding. ―Was there something particularly difficult about the character modeling this time? For example, Trico's appearance was pretty special, wasn't it? Sakai The difficult part about Trico was adjusting the density of its feathers. While we were animating, we didn't want there to be a gap between the base of the feathers and Trico's skin. In particular, around the face area, we placed the polygons one by one, like planting rice stalks. Tanaka With regard to the look of the feathers, not only did we need to make each individual moving feather represent the wind in the space, but they also had to express Trico's emotions. We also tried to make the transparency of the feathers during backlighting look impressive. ―The movement of the feathers really was very impressive! Sakai Otherwise, let me see... maybe the material around the eyes? 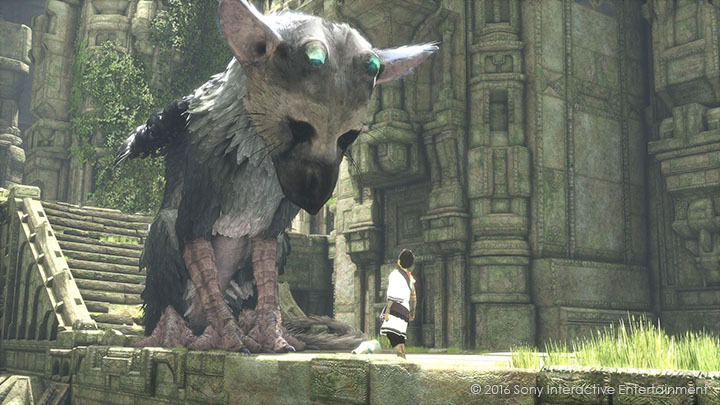 To be specific, the level of reflectivity of the lens of Trico's eyes and its pooled up tears. In the world of The Last Guardian, we tried as much as possible to suppress specular reflection (a shiny, glossy appearance). But Trico's eyes were one of the few materials that had specular reflection. We kept adjusting them over and over again to make sure they looked natural in any environment. 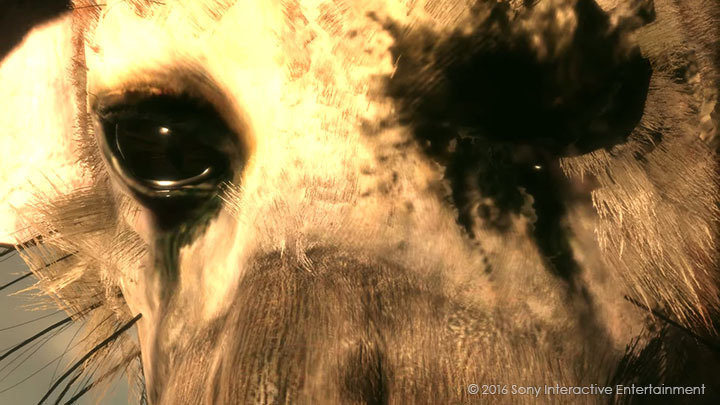 The lens of Trico's eyes and its pooled up tears. ―When you put it like that, you really didn't see a lot of shiny things in the game. Why did you suppress specular reflection? Ueda When you use specular reflection too much, the picture just starts looking a bit cheap. It either starts to get that CG-feel, or else just looks artificial. ―Yes. When everything is too shiny, it feels like something from a while ago, when people still thought that having that CG-feel was a good thing. Sakai That's because the range of possible textures has increased from before, so we are now able to bring out the subtle differences between materials. ―You must have observed a lot of different animals in order to produce this kind of texture and modeling. Do you all like animals? Sakai Everyone on the staff likes animals. (laughs) I especially like birds, and I had a roller canary as a pet. It was a very useful reference for the layout of Trico's feathers. Tanaka Trico has features from a variety of different animals, so we spent a lot of time observing the movements of many different animals, regardless of the species. I've always liked animals, so it was very stimulating for me to engage with the movements of animals by working on The Last Guardian. ―Actually, we have dogs and cats at my parents' house too. Maybe it was some kind of special connection with animals that led you all to Trico. 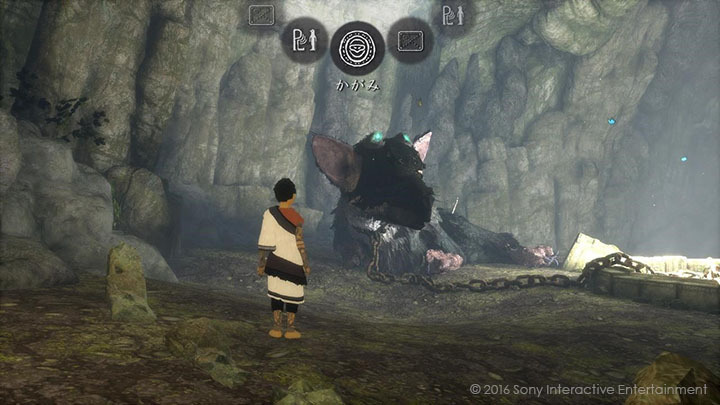 By the way, what about the other assets besides Trico? If you have any interesting stories, I'd certainly like to hear them. Sakai Some of what I was responsible for, besides Trico, would be things related to the boy. I particularly remember working on the design of the patterns that appear on the boy's body. They really changed a lot over the course of the production. There was a lot of trial and error but in the end, I made them based on designs in a picture that Ueda-san gave me. Ueda Maybe some players noticed this, but the pattern designs are based on the magical symbols shot by the enemy characters. ―Those magical symbols also look like the symbols on the buttons of the controller. ―When you get magic cast on you, you can erase the magic symbols by pressing the buttons, but during play-tests, some people complained that pressing the buttons over and over again made their hands tired. So you guys had to adjust the number of magical symbols that were generated. (laughs) ... but I digress. The detailed parts of the design changed a lot, didn't they? The patterns on the boy's skin are one example, but I heard that there were also a lot of twists and turns in setting things like the boy's haircut and his age. In fact, at the start, he wasn't even a boy at all, but rather a girl...? Ueda You knew about that as well? ―I even got to have a look at the pictures (laughs). ―I see, that certainly is a problem. Ueda Because of that, the reason everything came into its present shape is that we thought we could reduce those extra costs by making him into a lively-looking boy. Also, at the beginning, in order to really emphasize Trico's hugeness and strength in contrast to the boy, we set his age quite young, but later, in order to bring out the naturalness of his athletic abilities, we decided to make him a little bit older. 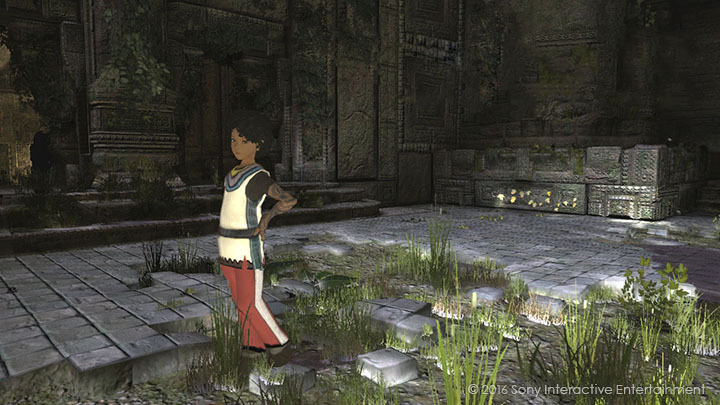 Some game screenshots from the time of the Playstation®3 production, when the main character was a boy with wavy hair. ―Along the same lines, I'd also like to ask whether you have any stories about the art of Trico overall? 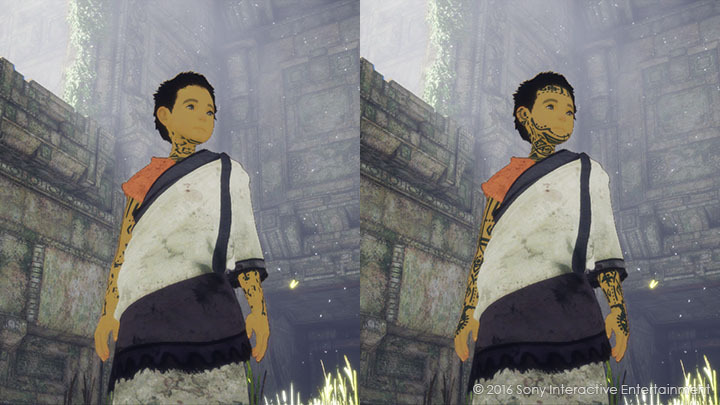 For example, Trico and the background all look very realistic, but the boy has a comparatively caricatured appearance. Did you have some kind of aim in doing this? Ueda Often, people have a tendency to think about "real" as the exact opposite of "caricature," but fundamentally, I think "caricature" is a method for heightening reality. I think of it as a technique for making people feel reality more fully, by eliminating or omitting unnatural information. Compared to an imaginary creature like Trico, it would not have been impossible to show a human in a natural way, —particularly the face expressions— but it would cost a huge amount of money, so from a cost-effectiveness perspective, it's just not worth it. In particular, the main project this time was Trico, so, with regard to the appearance of humans, we decided to ensure the sense of existence by leaning towards disengagement. It's for the same reason that characters like ICO and Wander looked the way they did. ―I see, so it's related to what people call the "Uncanny Valley." Ueda That's right. I think that maybe one of the places that art directors and directors can show their skill is in the way they select information to convey reality. ―Was the background also designed with this in mind? We heard a little while ago that the background was made part-by-part. ―So the setting wasn't decided? Ueda No. I wasn't talking about the setting. I was talking about the sense of existence of the world system itself. Like I was saying before, just because the game world is something like papier-mâché made from polygons, you have to make people feel the sense of existence by including a variety of artistic touches. I think that reality means being able to feel the parts that have been left out, even if there is no information at all. Tanaka Are there any examples, among other games, of works that have this "sense of existence"? Ueda Talking about old games, the background art of "Half-Life 2" was extremely good. In terms of the sense of existence of the world, it was outstanding. ※Half-Life 2: A first-person videogame developed by Valve Software, published in 2004. It is the sequel to "Half-Life," which featured Dr. Gordon Freeman as the main character. It received high acclaim worldwide. ―Is there some process to making art that has this sense of existence, or are there things that you have to pay attention to? And what kind of things do you get inspiration from? Ueda Yes... I'm not sure if you can call it a process, but with regard to the background models, we wanted to make completely sure that they did not remind people of any particular civilization. For example, even if you just make it Western style or Eastern style, the range of imagination gets narrower. ―It's true, in the setting of The Last Guardian, there is a unique worldview that you couldn't really pin down to any particular country. Ueda Worldview... I'm asked a lot about worldview, but to be honest, we put things together more often according to logic than according to inspiration. This is something I've said many times, but the first priority is game-play, and the other elements are additions for the sake of the game-play... it might be misleading to put it like this, but these are basically devices to make the game stand out more. There is an optimal world for the game, and it is important for this world to have a sense of existence. So it's not that we had some worldview we wanted to express from the beginning, but rather that it emerged as a result of logic. ―I see. You were talking before about how the game comes first and that you create the world for the sake of the game. However, in order to infuse this "sense of existence" into this kind of imaginary world, it's not enough to just make the background art really good. Ueda That's right. As I was just saying, it's because the game comes first. ―While on the subject, we’re starting to broach the subject of level design and the proper way to show the game, don't you think? I was also taking part in the level design meetings, and I heard a lot there, so I think I already have a rough understanding, but I'd still like to ask this again. What kind of struggles did you have with regards to level design? Ueda First, we began by imagining the images we wanted to show, including the background, and then we started thinking about the level as a way to naturally guide the character there. ―Ah, that's right. You said that before. Ueda For example, maybe the level that we called "Collapsing Bridge" during development would be easy to understand? Tanaka This level might be well known to a lot of people, since it was arranged and presented as a demonstration movie for E3 in 2015. In fact, I think we first made this level back in 2010. Ueda Yes. That's right. But at the time it was for the PS3. Ueda In the case of this level, from the beginning we wanted to display the image of the "boy desperately jumping from the scaffolding towards Trico," so when we were thinking about the idea for the level, we had to think about the kind of terrain that would make it so that any player, no matter how they played, would necessarily but also naturally get caught up in this event. ―So there is something like an image board right from the start. But how do you guide the players? Could you give me any concrete examples? Ueda For example, by setting up the stage on the bridge, we are able to put limits on the player's movements, or we make it unidirectional by setting up bumps, so that the player cannot move backwards. This way, the player's options naturally get narrower. Through the layering and combination of this kind of feature, we design the level in such a way that the player naturally gets caught up in the event. 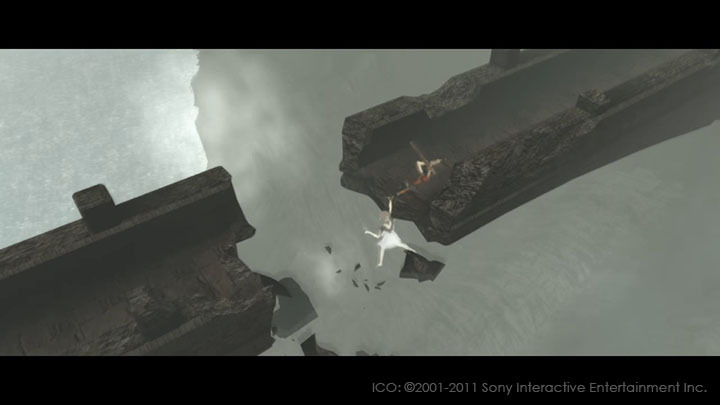 ―It's the same set up in ICO, in the scene when the player gets separated from Yorda on the bridge. Ueda Yes, maybe our way of thinking or method of conceptualizing hasn't changed since that time. ―But from then, you have managed to make things more interactive. Ueda It's easy to make the image you want to display into a cutscene, and then you can make that image as dynamic as you want. However, if you do this, I think there is no meaning in playing a video game, so the desire is to skillfully have the player just fall into it during the game, but without making it unnatural. For me, this is exactly the meaning of "level design," and it's certainly a fun part of making games, but it's also a really difficult part. ―I see. In fact, I also took part in the meetings, but when we moved into play testing*, there were some players who took a totally different route from the one that we had planned. Wow, I thought, level design is really difficult! But, then again, all the terrain and all the structures are made according to a plan. And as you were just saying, art is certainly not the number one priority. ※play testing: Identify problems and check the balance of the game software being developed by getting testers to actually play it. 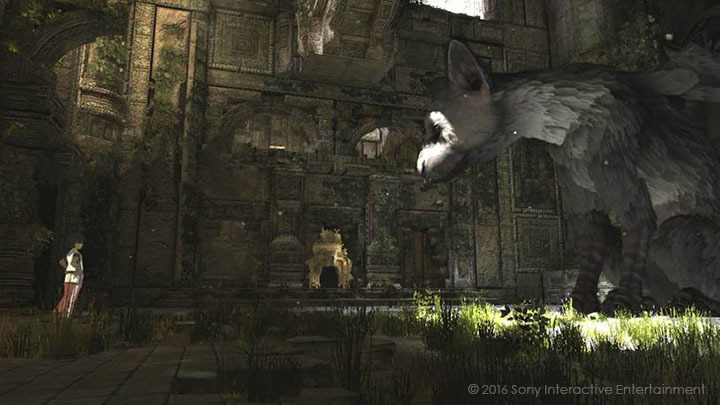 What was a big challenge during the production of The Last Guardian? ―There is a question about what was the biggest challenge during the production of The Last Guardian? 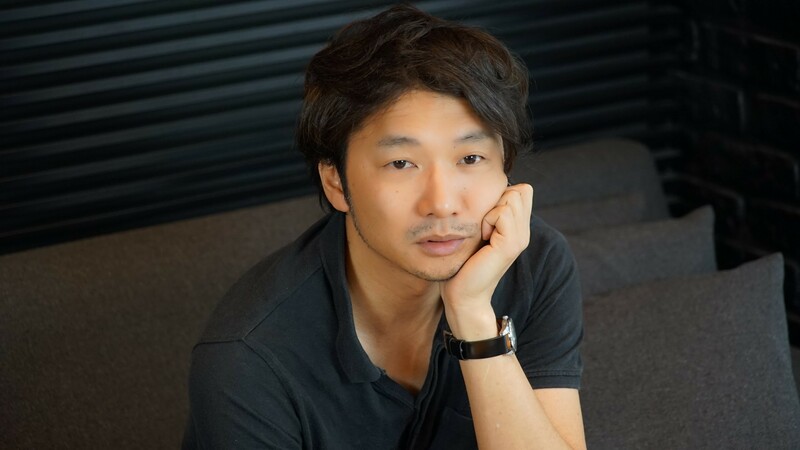 Ueda Well, compared to ICO and Shadow of the Colossus, with The Last Guardian, the project began with the idea of keeping the technical challenges to a minimum, and focusing that extra energy on level design and overall adjustment. ―Perhaps you could say that the challenge was for there to be no challenge? Ueda Yes, but of course, it was necessary to surpass the previous two works in quality and completeness. If you want to talk about challenge, maybe that would be "Trico" itself. Tanaka That's what I think. I really think that more than anything, maybe the biggest challenge was creating Trico as an animal of its own. ―I see. Also, I'm not sure if it's right to call this a challenge, but this time Ueda-san kept saying "we want to make it easy to understand." 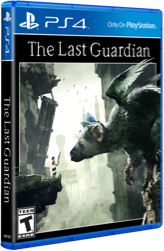 It's not that I think your previous works were difficult to understand, but The Last Guardian is different from what came before, and I think that maybe there was some challenge in this. Ueda Yes. There was definitely a desire to make The Last Guardian easier to understand than ICO or Shadow of the Colossus. Compared to ICO and Shadow of the Colossus, which were like haikus, maybe this work is like the slightly more concrete tanka poem or free verse. For example, in The Last Guardian, we depicted the place the main character lived in, but in ICO and Shadow of the Colossus, it was left unclear. This would be another difference. ―I think that might be a really good way to put it, that comparison between haiku and free verse. Ueda Yes. 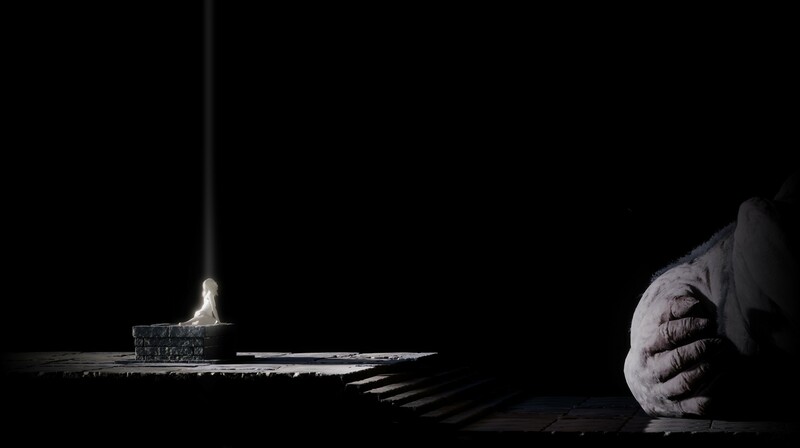 If anything, ICO and Shadow of the Colossus have the feeling of an indie movie. But, compared to this, our impression during the production of The Last Guardian had changed. It felt like we were dealing with a major work. In particular, we got the sense that this is what the people around us were expecting. ―Really? I only got involved in the project near the end of production, so I didn't know that there had been this kind of change in the way you were dealing with things. Ueda It's not like anyone had made such a demand, but it did feel like expectations were getting progressively larger over the course of production. In aiming to make such a "major" work, we wanted to make sure we properly took care of every person—which is to say, there was a need, as much as possible, to get rid of all the parts of the game that were unpleasant or difficult to engage with. The "R1 grabbing" change that we mentioned earlier is one example of this. ―I see. I think I understand the challenge of wanting to make a major work that would be easier to understand than your previous two projects. However, at the same time, if we're talking about ease-of-understanding and ease-of-use, surely there are game symbols that everyone already understands. Did you ever think about swinging over to that direction? Ueda We need to discuss what give something the feel of a game, for example, you can put in special ingredients like HP trackers or item management systems that easily produce the feeling of a game. However, we wanted to avoid putting that stuff in, to rebel against putting that stuff in, just for the sake of... for the sake of "making it into a game." But while saying that, in the end, we still have to make a game. So it's a question of where you draw the line. ―Maybe it's just that desire to rebel that leads to originality. I'd say that it's the exquisite balance between the game-like aspects and the aspects that are not game-like that probably makes the biggest contribution to the experience of the game. ―As a final point, there is one more thing I would like to ask about, even though it will take us a bit far away from The Last Guardian. Tanaka Yes, what is it? ―What was that image that you published over New Year's? ―Is it that you were just publishing an image, and that there was no particular news? Ueda Yes... There is nothing in particular to talk about. The image that was published over New Year's. You can see the figure of a girl sitting on a pedestal and something like a big hand beside it. ―So this is not your next project? Ueda In the end, I'd say it's just one picture from our process of trial and error. Tanaka For our next project, we're taking on the challenge of a new way of producing, different from what we've done before. Ueda Yes, up to now, we would make one single video to form a concept, and we would begin making the game from there. We did this because it was the most efficient way to convey what kind of game it was going to be. But now, the capability of real time rendering has increased, and game engines have become more refined. Up to now, we would start too soon without thinking things through, and we would make the video that would turn into the concept. This time, however, we are using the game engine right from the start, and have started by fully working out the game design. Having actually tried it out, this way seems to be very effective. Tanaka That's right. Recently, game engines have become very powerful, and thanks to this, the hurdles involved in making games have gone down. 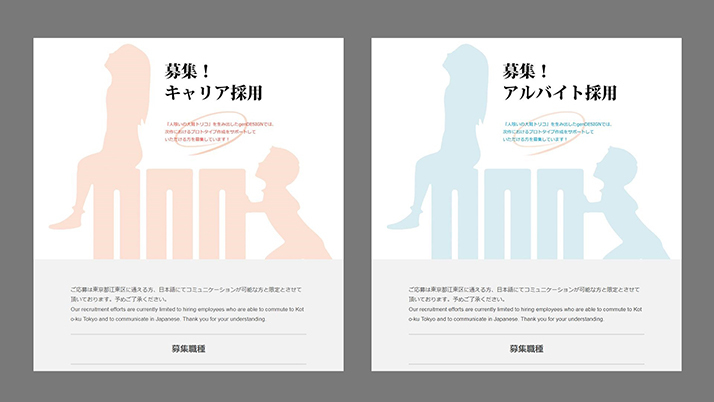 Of course, genDESIGN is also advancing this kind of research. But because of this, we now need people who can use the recent game engines and the tools installed with the latest technology, in addition to the old conventional ways of game-making. We really hope that people with these kinds of skills will come and work with us. ―I see. So genDESIGN is recruiting people right now. So, one more time, why don't you tell me about what kind of company genDESIGN is, in a way that people who want to apply will easily understand? 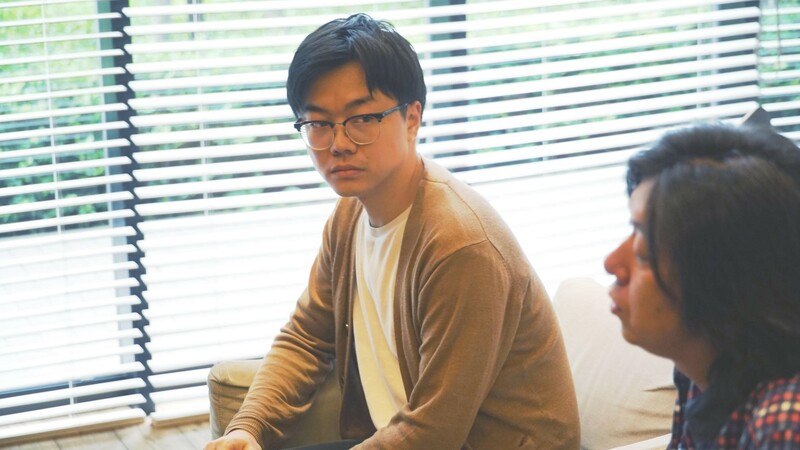 Ueda We start by doing research on the kind of user experience that we want to offer, and then we research methods for producing the highest quality results within a budget, and then we wrap it all up into the shape of a game. Sakai There are not a lot of us, so in the game industry where division of labor is progressing, it is really appealing to be able to challenge a variety of different things that go beyond the normal divisions between, for example, designer, programmer, and planner. ―So, what kind of talent is a studio like genDESIGN looking for? Ueda Well, maybe someone who has a good sense for speed and a high capacity to work. A person who is not afraid of making mistakes, and who makes a lot of artwork in a short period of time, even if the work is not very good. Of course, it doesn't hurt if the work is good, though. ―I see, the feeling for speed? Ueda We are now using PCs, and it is a digital production environment, so you can save part way and undo as much as you want. It's almost no risk, no cost, so rather than doing a job once with a high degree of precision, having the ability to try things quickly, many times over, is an easier way to get good results. Because of this, I think that people who just try things out without hesitation, and without making too much of a fuss, are able to get good results in this digital era. ―Would you say that quality definitely follows from this? Ueda Maybe in the present day, it's by trying things over and over again that quality goes up. That's the reason that speed is directly connected to high-quality and completeness. ―Is there anything else you would like to add? Ueda The last thing is the capacity for ideas. A person who can think. And by thinking, I mean the ability to come up with as many options as possible in your mind, and then, after doing thought experiments on each one of those options, to choose the one you think is best. Of course, the thought experiments you do in order to decide on the correct option—which is to say, the accuracy of the calculations in your mental simulations—are important, but the first question is whether you have thought up enough options. I think that thinking is creativity, which is equal for everyone, regardless of the goodness or badness of the time or of the environment. Tanaka At genDESIGN, we are currently looking for new people, so we would like anyone who is interested to please knock on our door. This is the end of our five part special symposium on The Last Guardian. It has been a very long serial article, so I thank you all very much for staying with us to the end. This serial began with a request for questions on Twitter, and I apologize for the fact that we were unable to respond to all of these questions. Finally, as Ueda-san talked about on Twitter, with the reception of the entertainment prize at the 21st annual Japan Media Arts Festival, it looks like Ueda-san and the staff of genDESIGN are bringing an end to Trico and are now progressing steadily toward their next project. It looks like they have changed their method of production for their next project, so we look forward to seeing the way genDESIGN develops in the future.